For Rick Perry, A Restless Life On The Farm Before he was elected governor of Texas, or to any of a series of positions going back more than 25 years, Perry grew cotton and raised cattle on land that his family had worked since the late 1800s. In every campaign, he has run as a man shaped by that experience. But real life on the farm was far less romantic. 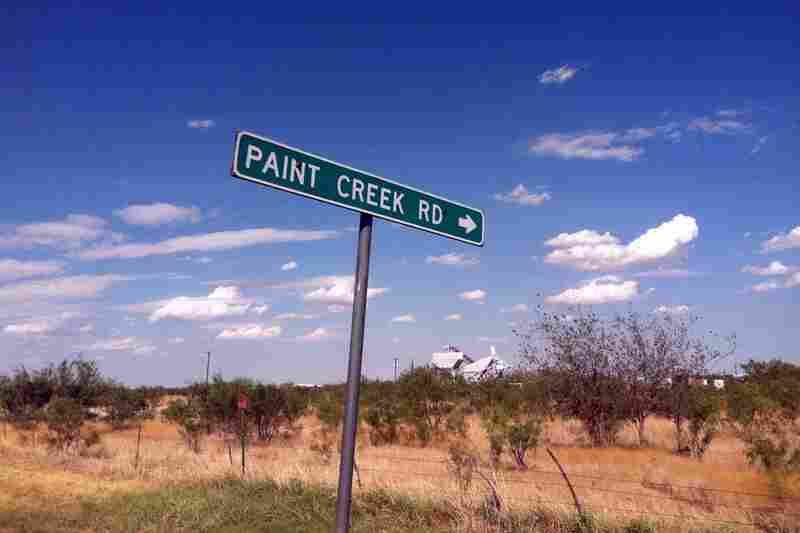 After he left the Air Force in 1977, Rick Perry returned to Paint Creek, Texas, to be a dryland farmer. "Paint Creek reminds me of a sense of community that seems lost today. ... For me, Paint Creek was not merely an idea; it was the center of civilization, and everything else was an alternative universe," he wrote in his book On My Honor. 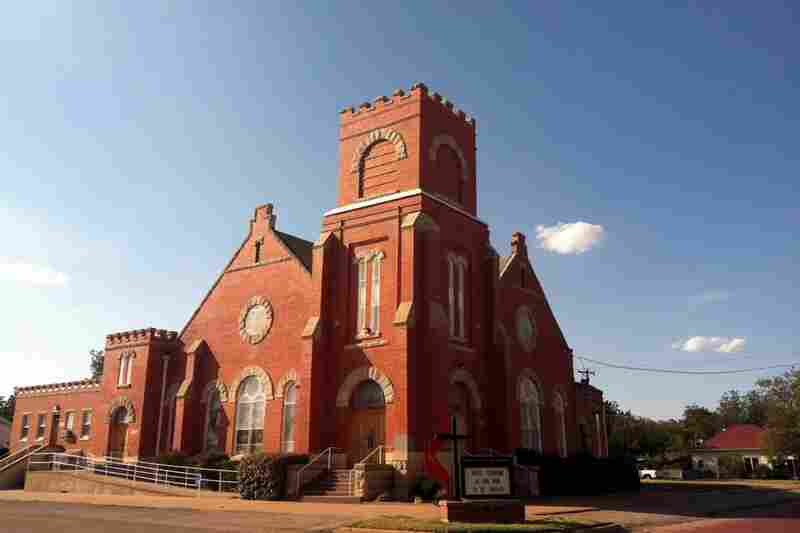 Perry attended this Methodist church in the nearby town of Haskell. "To some, Paint Creek is a throw-back in time — a fading memory of the way things used to be, when you knew everyone within a 15-mile radius of you, and when you saw each other at work or school and then later at church," Perry wrote in On My Honor. 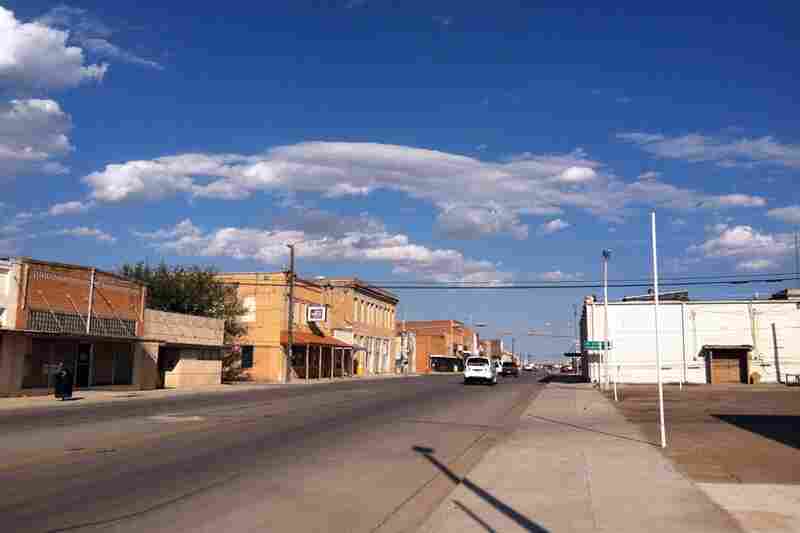 Downtown Haskell, the nearest city to Paint Creek, is still sleepy. Wallar Overton, a lifelong friend of Perry's, set out to look for lost cows and a bull on a remote part of his land in Paint Creek. He drove past dry, parched grass, too dry for the cattle to eat. Overton finds the lost female cow called Miss Texas, for the spot of white fur on her forehead that vaguely resembles the Lone Star State. Perry "liked the ranching part of it. See him on a horse, and this and that, but you know, driving a tractor I guess gets a little boring. He'd rather mess with the horses than livestock," says farmer Phil Coleman, who's known Perry all his life. 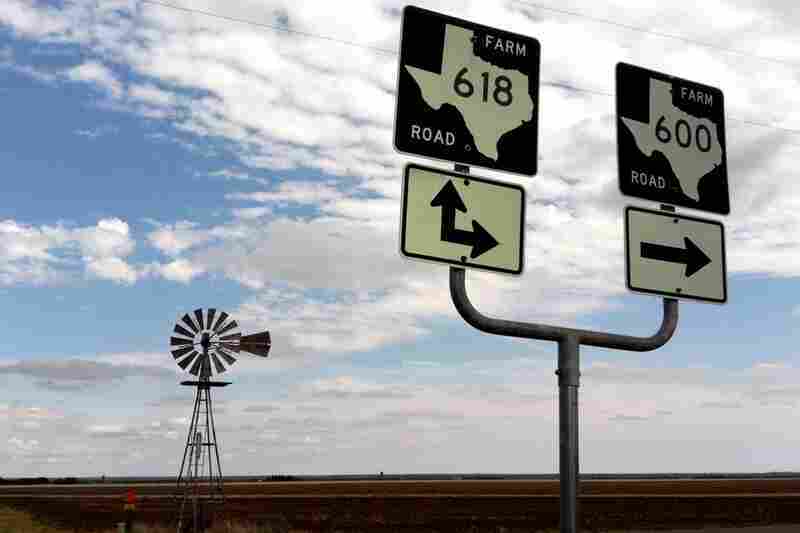 Perry's parents still live on Farm Market Road 618. The cabin with no running water where Perry grew up is long gone. 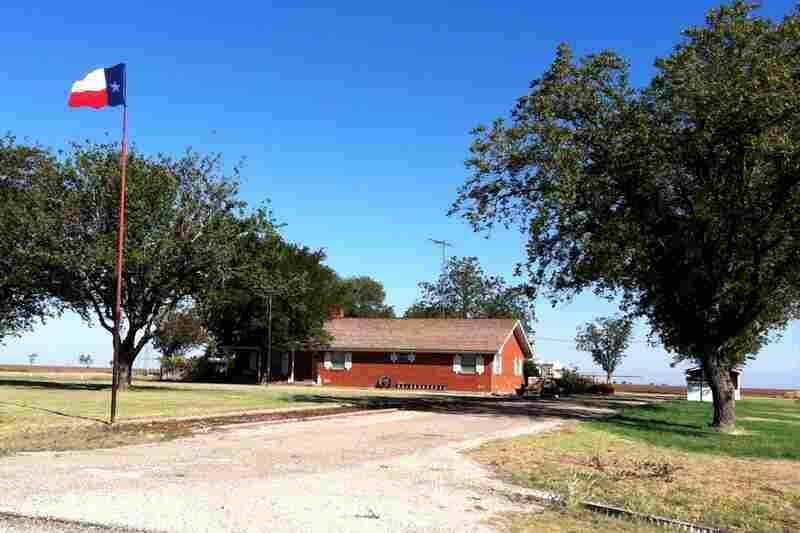 He later moved to this modest ranch house, where his parents still live. An ad from his run for Texas agriculture commissioner — his first shot at statewide office — calls him "a born leader, and the only farmer-rancher on the ballot." Perry won that race in 1990, as he has won every campaign he's run. Now, Perry is seeking the presidency, and at a recent event on a farm in Iowa, he wanted his audience to know that he's one of them. "Our part of the world is just drought-y. It doesn't rain there on a regular basis," he told the crowd. "It's the desert Southwest." Perry's time as a tenant farmer began when he got out of the Air Force in 1977, and returned to his hometown of Paint Creek, Texas, in Haskell County. It was a place to figure out what to do next with his life. "You get lots of thinking time, just driving around in your tractor, doing your work, in your pickup, going to feed — things like that," says Wes Utley, an agriculture official in Haskell County. "There's lots of time for reflection." This is a remote part of the state, to say the least — there's farming, hunting and few people. It's also about 30 miles and one county over from Throckmorton, home of the hunting lodge the Perrys used to lease — the one with the racially derogatory name. In the Perry campaign ad for agriculture commissioner, he is the spitting image of the Marlboro Man, wearing a cowboy hat and chaps as he saddles up and rides off into the sunset. Rick Perry drew on his background as a farmer and rancher when he ran for agriculture commissioner in Texas. But real life on the farm was far less romantic. "Even though he did travel the world as an Air Force pilot, he was based in Abilene, Texas, 60 miles from his hometown," says veteran Texas journalist R.G. Ratcliffe, the author of a forthcoming biography of Perry. "So coming back home for Rick Perry really just kind of meant walking off the base and driving an hour back up to Paint Creek." But psychologically it was a far greater distance. Instead of flying giant military cargo planes, Perry planted cotton and wheat, and raised cattle. There were long spells of dry weather to contend with. And there was another significant complicating factor. "He came home to work with his dad, and the problem, as he's said it on more than one occasion, was that his father didn't look at him as a partner — his father looked at him as the teenage boy that had gone off to college that had come home to do some more chores," Ratcliffe says. On a recent fall Friday night at the local high school football game, 61-year-old Paint Creek farmer Phil Coleman stands on the sidelines. He has known Perry his whole life — they went to school together and were teammates on the football team in the late '60s. He says Perry was just "Rick" when he first came back to Paint Creek to farm, and "he's just Rick now, too, to me." Coleman says Perry liked the "ranching" part of life at Paint Creek. "You'd see him on a horse, and this and that, but you know, driving a tractor I guess gets a little boring." By all accounts, Perry was restless. He farmed for about 13 years after leaving the Air Force on the thousands of acres he and his father leased, but also on a small 40-acre farm the family owned. For a number of those years, when he was in the state Legislature, a big portion of the income from his own property came from federal farm subsidies, which actually paid him not to produce a crop. At times, Perry also made money on the side working as a pilot for hire. 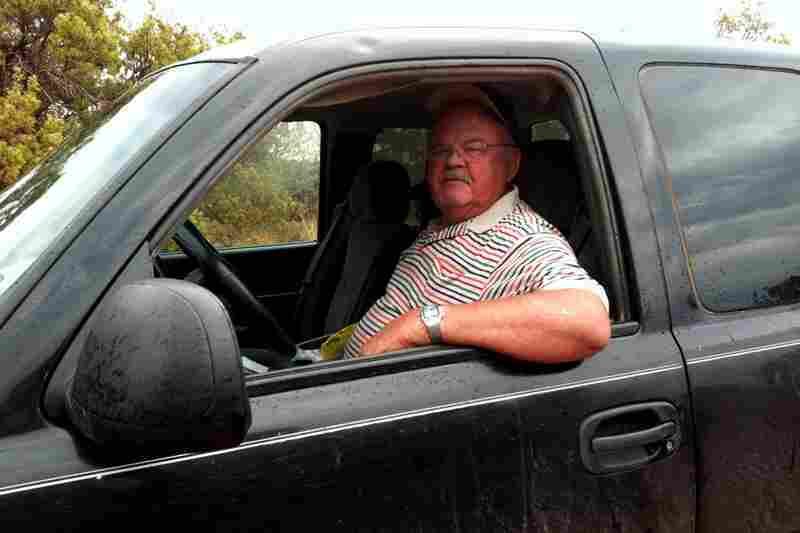 Wallar Overton, 72, is another Paint Creek farmer. On a recent day, he and his wife, Steffi, head out to a remote part of their land to search for some lost cattle that they hadn't seen in almost a month. They drive past miles of red clay farmland, cotton fields and dry parched grass. And there are gathering rain clouds off in the distance. "I live with the sky and I die by the sky. We've had about 3 inches in the last year," says Wallar Overton. "It's been really a hardship." Overton has known Rick Perry, who is 11 years his junior, since Perry was a member of a Boy Scout troop led by Overton's father. 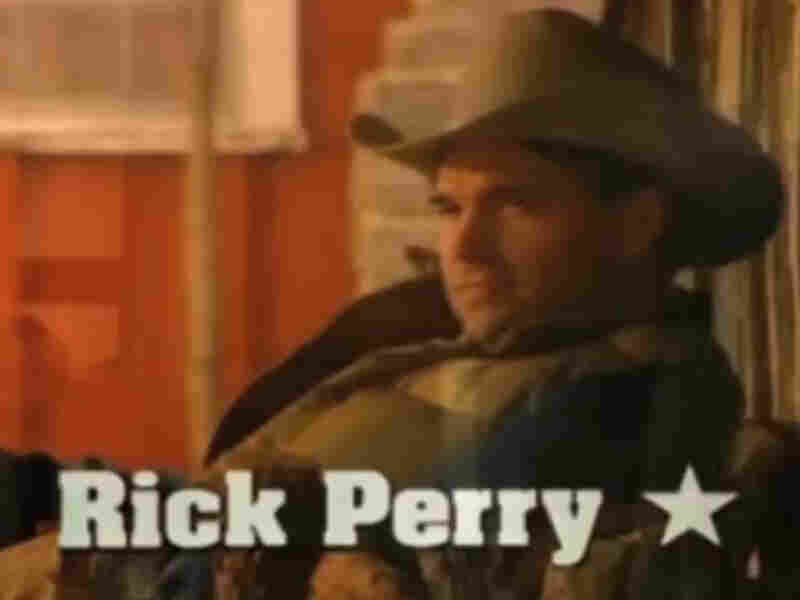 During his run for Texas agriculture commissioner, Rick Perry campaigned on his farming and ranching roots. Here, he's seen in a screen grab from one of those ads. Asked what kind of farmer Perry was, Overton laughs. "I think he just parked it here for a while, I really do. I don't think he had any intention of ever staying. But when he come back from Europe, or active duty, to Paint Creek, Texas, it's like slamming the brakes on, you know?" But when Perry found politics, he found something he was very good at and something perfectly suited to his gregarious personality. 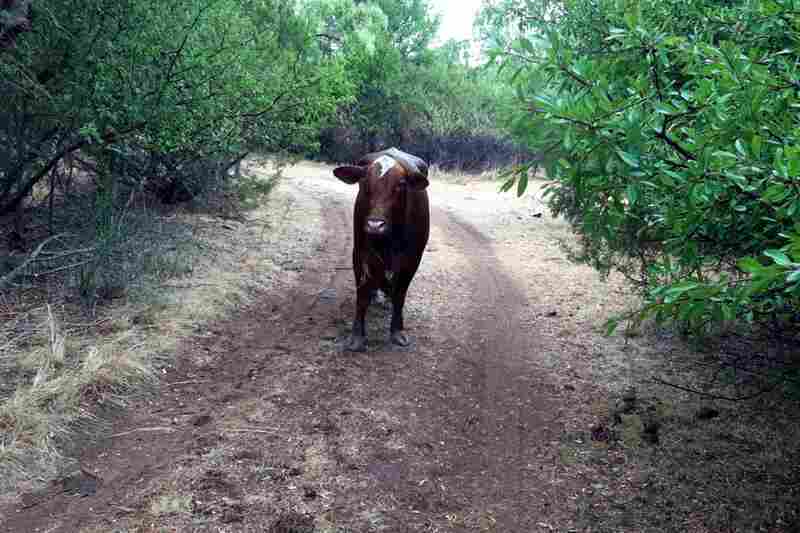 Overton and his wife continue their drive over narrow dirt farm roads looking for their lost cattle. A light rain starts to fall. Then, all of a sudden, in the road ahead, the Overtons find what they were looking for. "Well, look who's here," Overton says. It's a brown female cow they call Miss Texas, because of the spot of white fur on her forehead that vaguely resembles the shape of the state. Overton slices open a bag of feed in the back of the pickup and it spills out onto the ground. Moments later, a massive black bull weighing a ton and easily double the size of Miss Texas saunters up. He stares warily at a visiting reporter, the only one in the group he doesn't know. Then he heads for the pile of food. It's just another day on the farm in Paint Creek, Texas — the kind of day Rick Perry left behind more than two decades ago, but that still helps provide the backdrop for his life in politics and his current run for the White House.